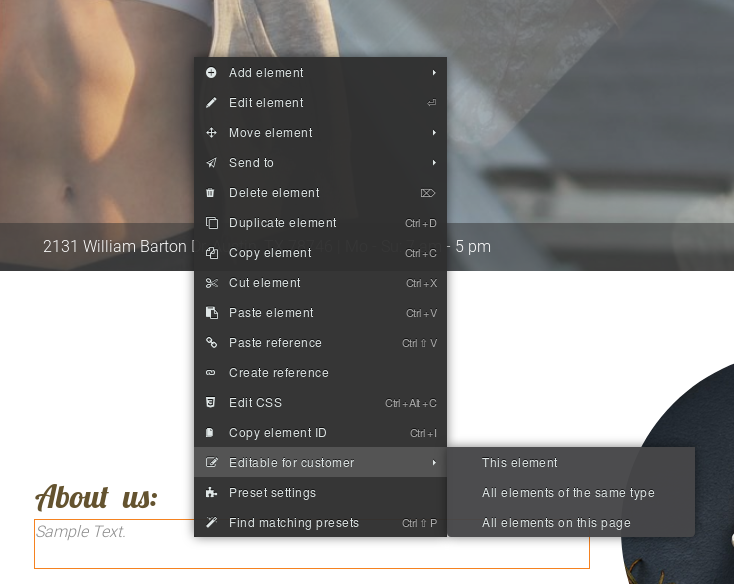 Another powerful feature is that you can enable your customer to edit parts of the website. In this guide we will show you how step-by-step. By right-clicking any element and selecting Editable for customer you can enable access to the Customer CMS and specific elements to be edited. With the checkmark visible you enabled only this element, all elements of the same type or all elements on this page to be edited. Blocking the element(s) from being edited is as easy as clicking again to remove the checkmark. Once the status of this project has been set to Done , Feedback or Publish (see #1) and at least one element is set as editable, your customer can now go to Customer View in the Dashboard to find the Customer CMS (see #2). A new card appeared, called Edit Website (see #3). Once clicked your customer needs to hit Edit Website now on the following page to access the Customer CMS.